The opening this May of the nuclear Non-Proliferation Treaty (NPT) review conference at the United Nations seems likely to feature a conflict that has simmered for decades between nuclear nations and non-nuclear nations. By the mid-1960s, five nations had developed a nuclear weapons capability: the United States, the Soviet Union, Britain, France, and, most recently, China. But numerous other nations were giving serious consideration to joining the nuclear club. They included Argentina, Brazil, Egypt, India, Israel, Pakistan, South Africa, and West Germany. Millions of people and many governments feared that the nuclear arms race -- already dangerous enough -- was on the verge of spiraling totally out of control. In this context, the U.S. and Soviet governments suddenly found something upon which they could both agree. Having amassed vast nuclear arsenals for their Cold War confrontation with one another, both decided that it would be a good idea if other nations refrained from developing nuclear weapons. Thus, in the fall of 1965, the two governments submitted nonproliferation treaties to the U.N. General Assembly. "Both superpowers really got behind the Nonproliferation Treaty," recalled U.S. Secretary of State Dean Rusk, "because we and the Soviets basically were on the same wavelength." But the non-nuclear powers sharply objected to the U.S. and Soviet proposals, which they pointed out – correctly -- would establish a two-tier system. Alva Myrdal, Sweden's disarmament minister and a leading proponent of nuclear disarmament, declared that "the non-aligned nations . . . strongly believe that disarmament measures should be a matter of mutual renunciation." They did not want a treaty that "would leave the present five nuclear-weapon parties free to continue to build up their arsenals." The governments of numerous NATO nations raised the same objection. Willy Brandt, West Germany's foreign minister, maintained that a nonproliferation treaty was justified "only if the nuclear states regard it as a step toward restrictions of their own armaments and toward disarmament." In short, non-nuclear nations were unwilling to forgo the nuclear option in the absence of a similar commitment by the nuclear nations. As a result, the NPT was reshaped to provide for mutual obligations on the part of non-nuclear and nuclear nations. 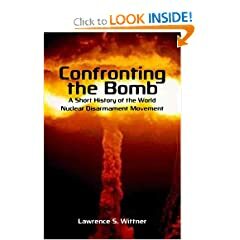 Under its terms, each non-nuclear signatory pledged "not to make or acquire nuclear weapons," as well as to accept a safeguard system, administered by the International Atomic Energy Agency, to prevent diversion of nuclear material from nuclear reactors to nuclear weapons development. Furthermore, Article VI of the final version provided that nuclear signatories would "pursue negotiations in good faith at an early date on effective measures regarding cessation of the nuclear arms race and disarmament." On June 12, 1968, this revised NPT, now incorporating provisions for both nonproliferation and disarmament, swept through the U.N. General Assembly by a vote of 95 to 4, with 21 abstentions. Although, ominously, a number of nations with nuclear ambitions refused to ratify the treaty, the NPT did provide an important milestone in global efforts to avert nuclear catastrophe. In some ways, the NPT was a success. After it went into force in 1970, almost all nations capable of building nuclear weapons rejected this option. Furthermore, through disarmament treaties and individual action, the nuclear nations divested themselves of a significant number of their nuclear weapons. Even so, thanks to a lingering belief that national security ultimately lies in military strength, nations have resisted honoring their full obligations under the NPT. The nuclear powers delayed implementing their rhetorical commitment to full-scale nuclear disarmament. Meanwhile, some non-nuclear nations, charging the nuclear powers with hypocrisy, began to develop nuclear weapons themselves. Today, 42 years after the signing of the NPT, more than 23,000 nuclear weapons remain in existence and the number of nuclear powers has grown from five to nine. Thus, the NPT review conference this May could simply continue the old game of duplicity and delay. Nuclear nations could avoid making plans to eliminate their very substantial nuclear arsenals, while demanding that other countries remain non-nuclear. Non-nuclear nations could point to the failure of the nuclear nations to disarm and use that as their justification for joining the nuclear club. But there is an alternative. The world public might decide that enough is enough -- that it's time to move beyond the cautious, half-way measures of the past and bring an end to the terrible danger of nuclear annihilation. That would require a massive outpouring of public sentiment, this May and in the following months, demanding nothing less than the abolition of nuclear weapons. Such an outpouring would provide a solid basis on which reluctant government officials might finally do what they should long ago have done: take effective action to build a nuclear weapons-free world. I'd personally say his concluding paragraph is rather naive, too. It's my opinion that there is zero possibility of the US regime giving up it nuclear weapons, at least until they can replace them with something juts as powerful. These are not hippies we are considering, but the kind of men who spend their lives fanatically accumulating power.